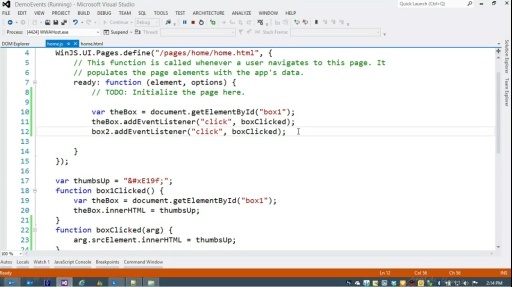 Michael Palermo is back for an episode and shows us how to implement CSS3 animations into Windows Store apps! 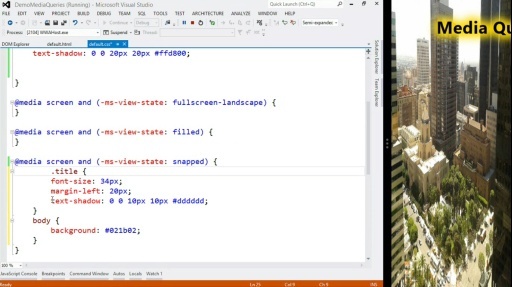 Developing for Windows 8 in 1/2 the time! Ever wonder how you can develop for device features you really like even though your personal device doesn’t support it? Well in this episode, Michael Palermo shows you the power of the Simulator in Visual Studio and how you can test features for various devices. In today’s episode Michael Palermo will show you how to manage your programs to work in different layouts via Media Queries. If you need to know how to control what needs to be done in various layouts – Portrait, landscape, snap-view, etc. this short how-to video is just for you. If you are not familiar with animations, the name itself is practically self-explanatory. Animations can deliver very appealing “eye-candy” in a variety of ways including object movement, resizing, transforming, fading, style changes, and much more. 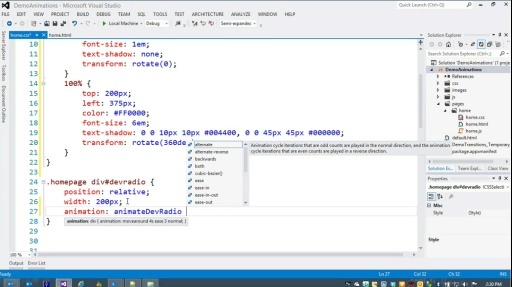 Because animations have been around awhile, there is plenty of information out there to help you get started, such as the animations topic at the IE 10 Guide for Developers and Hands On: Animations on IE Test Drive. Our focus here is more on how to use animations in the context of writing apps for the Windows Store. Why so much reduction? When writing Windows Store apps, we are not worried about supporting multiple browsers. Whatever standards work for IE 10 are all we need. Granted, if you used the previous rules with all the vendor prefixes while creating an app - no error would occur, they would just be ignored. The click event handler for the “message” element toggles the class name. Once the app sees the element is assigned to an animation (which is what the new class does), it triggers the animation. The toggle method of classList returns a boolean value based on whether it added (true) the class name or removed (false) it. The above event handlers are handy and can allow a chain of complex animations. For example, in the event handler for when an animation ends, you can add code to trigger a completely new animation. Effect is triggered when a targeted property value changes, usually due to a state change such as when a :hover is defined. A targeted property value changed in code will also trigger a transition. Syntax is much simpler, thus, effect is usually simpler than what can be done with animations. Another point to think about is what the intent of each technology is. Transitions (as the name implies) are really intended to provide a nice visual effect when something is changing state. Animations can be used for anything pertaining to the logic of the application. Animations offer a great way to enhance the user experience. However, too much of a good thing can become an annoyance. So be judicious with your implementations of animations. It is an exciting time to be a developer with web skills. 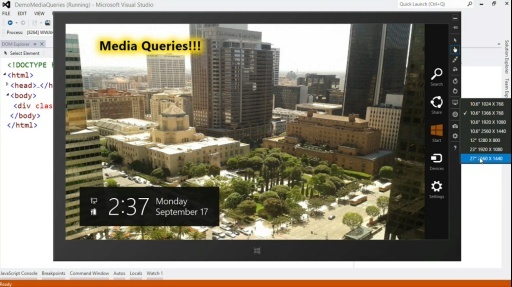 Harness what you know and use it to great some great applications for the Windows Store. Be sure to take advantage of all the resources available at Generation App! If you haven’t been using transitions or know what they even do, then let’s start with a quick description: Transitions allow content on the screen to change from one visual state to another in a gradual, animated way. To learn more about the basics of transitions, check out the Transitions topic at the IE 10 Guide for Developers, and play with the Hands On: transitions on IE Test Drive. The focus here will assume you know the fundamentals of transitions and want to how to use them when developing apps for the Windows Store. The subtle change above is adding the :active pseudo class if the targeted element is pressed down. This may not be practical in some circumstances, but it at least involves use touch devices when using you app. When the rules are implemented above, a switch in the application to a snapped position will create a simple shrink effect. When switching out of snapped view, the text quickly grows. Careful use and experimentation can lead to a polished user experience. In the code above, an anonymous function is used as the event handler when the transition ends. Note that the argument supplied to the function has an elapsedTime property, allowing you to determine how long the transition lasted. Because the transition is triggered by the :active pseudo class, it will only reach 4 seconds if the user continues to press down on the element. The code above detects the user let go too soon, and changes the text of the element to encourage the user to keep pressing. The code now responds if the transition reached a full 4 seconds. If that happens, it changes the text of the element to “Let Go…”. It also calls on the element’s classList property, and adds a new class named vanish. The addition of the class rule will invoke another transition that will make the element shrink and disappear in 1 second. The classList property allows you to easily change the the state of the class attribute, which will invoke a transition if any targeted property values change. You can use classList for adding, removing, inspecting, or toggling class names in the attribute. You can also simply change any of the elements style property values directly to also invoke a transition. Have fun coding, and be sure to benefit from all the resources available to you at Generation App!